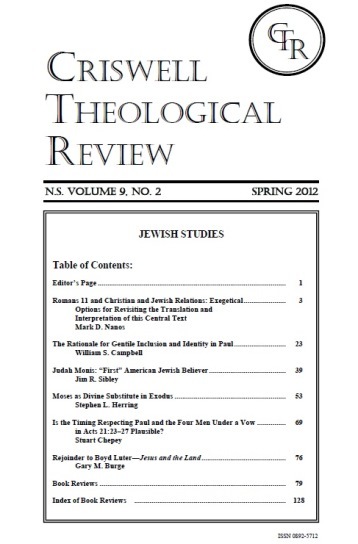 The Spring 2012 edition of Criswell Theological Review features several articles on the theme of Jewish Studies, including essays on Jewish and Gentile identity “in Christ.” As our readers know, this issue is the focus of much debate among scholars of all theological persuasions. Our lead article, “Romans 11 and Christian-Jewish Relations,” is contributed by Mark Nanos, the Soebbing Distinguished Scholar-in-Residence at Rockhurst University (MO). Based on his careful exegesis of the text, Nanos challenges translation committees whose English word choices has led many to conclude erroneously that God’s people (Jews) as natural branches have been severed from the Olive tree, had their hearts hardened, and thus have become enemies of the gospel. Nanos then suggests that alternative translation options, based on contextual and historical considerations, which will lead to a more accurate interpretation of this well-known passage. William S. Campbell, the Reader in Biblical Studies at the University of Wales (UK), offers the essay “The Rational for Gentile Inclusion and Identity in Paul.” Campbell argues that “in Christ” Jews and Gentiles keep their respective ethnic identity. Jews do not forsake the Law to become Christ followers any more than Gentiles adopt the law when they become believers. Thus for Campbell, Gentiles, while being Abraham’s children by faith and heirs of the promise, are not Jacob’s (Israel’s) children under the Law. In his fascinating article, “Judah Monis: ‘First’ American Jewish Believer,” Jim Sibley, the Associate Professor of Jewish Ministries at Criswell College (TX), seeks to identify the first Jew in America to become a follower of Jesus. A shroud of mystery hangs over the issue. Some historians believe that other Jews embraced messianic belief prior to Monis. A few even attempt to discredit Monis as an opportunist who “converted” to Christianity in order to obtain a teaching post at Harvard. Sibley does a good job at unraveling the mystery. In “Moses as Divine Substitute in Exodus,” Stephen L. Herring, Lector in Biblical Hebrew at the Oxford Centre for Hebrew and Jewish Studies, University of Oxford (UK), draws parallels between Moses, the golden calf and Yahweh. Herring breaks new ground, suggesting that both Moses and the calf function as a cultic image or an extension and manifestation of God’s presence to his people. According to Herring, such an interpretation fits nicely in the context of Exodus 32-34. Stuart Chepey, Subject Coordinator of History and Religion at Parish Episcopal Upper School (Dallas, TX), examines Paul’s rite of purification in Acts 21:23-27 to determine if it constituted a Nazirite vow. In his article, “Is the Timing Respecting Paul and the Four Mean under a Vow in Acts 21:23-27 Plausible?” Chepey interacts with the text, Philo, and Josephus to draw his conclusions. Chepey is also the author of Nazirites in Late Second Temple Judaism (Brill, 2005). Our final entry is Gary Burge’s “Rejoinder to Boyd Luter” in which he responds to Luter’s article-length assessment in CTR (9:1, Fall 2011) of his book Jesus and the Land: The New Testament Challenge to Holy Land Theology. Since the controversy surrounds modern-day Israel’s legitimate right to occupy the Holy Land, this rejoinder fits nicely with our theme. Gary Burge serves as Professor of New Testament at Wheaton College and Graduate School (IL). In the Fall 2011 edition of CTR there was only space for a few book reviews; therefore, we have allotted 50 pages in this issue, which should more than make up for lost ground. We hope the reviews will provide a critical analysis of the selected titles and help you to determine if the book should be on your shelf for further reading. Remember that you can access all past issues of CTR online at atla.com. Your local university or seminary can provide you with a password.